Take A Risk and Say It! You Can Do It! Take A Risk and Say It! Are You Afraid To Take A Risk And Say It? A big part of social confidence comes from being able to speak your mind and share what you’re feeling and thinking. When we’re feeling uncomfortable and nervous, we often feel inhibited and are scared at the thought of sharing what’s going on inside of us. What keeps you from speaking up? What stops you from sharing your thoughts, feelings, and desires with ease? Fear of a negative reaction from the other person. If they knew I was feeling this way (scared, irritated, worried, sad), then they’d be turned off, upset, and ultimately not want to be around me. Therefore, I must hide this from them, so they continue to like and love me. The problem with this reasoning is it creates a closed loop. You aren’t sharing because you anticipate a negative reaction, but you never get a chance to actually check this out. All of this occurs inside of your own mind. This is a closed loop. The key to creating deep, lasting confidence is to take the risk and share what you’re experiencing. It may be messy, confusing, and even lead to a little conflict. But these are the very things that’ll give you confidence and trust in yourself to handle these types of challenges in the future. Confidence is not about always being tough, unruffled, and free of uncomfortable feelings. True confidence comes from a willingness to accept all parts of ourselves, which include our feelings, thoughts, and desires. Yet so many of us have a deep, nagging fear that something is wrong with us. We spend much of our time positioning and presenting ourselves in such a way that people don’t find out what we’re really feeling and thinking. This little dance is exhausting and can drain your energy and enthusiasm. Worse still, denying who you are because you think you’re supposed to be something different is one of the greatest forms of pain you can experience. The best way to undue this fear is to commit to regularly sharing what’s happening inside of you with those around you. This steady practice of taking small risks to reveal your true self creates the building blocks of a deep foundation of inner confidence. 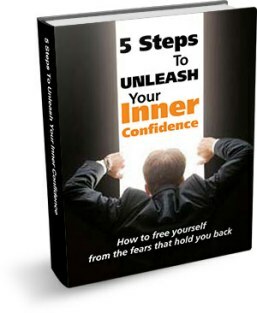 To learn more about how to develop self-acceptance and gain the courage to take risks, check out this free eBook. 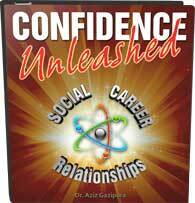 Dr. Aziz is the world’s leading confidence expert. He helps people break free from hesitation, fear, and self-doubt so they can rapidly grow their businesses, become more powerful leaders, and enjoy outstanding relationships.